Today’s demo. Busy, cold when will the suffering end? 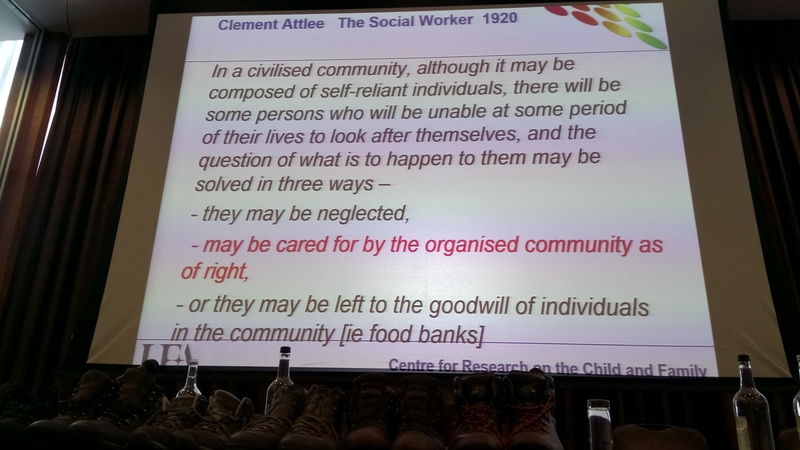 Man refused any more food parcels because hes already had 3. This rule is obscene. Today’s demo felt a bit strange. It’s the Manchester Mayoral elections today and everyone is so busy campaigning for that. Also it’s one of those weeks where members are called away. It’s important that they deal with their personal issues. As a result numbers were expected to be low. I arrived and the lady delivering the food parcels was waiting for me. I walked over with her to collect them. As I did I noticed a gang of people gathered across the road waiting for food parcels. We make no judgement, but we do make sure that they are accessing the local help available to them. They can get a tad aggressive so I’m so glad that I wasn’t on my own. It was a clear reminder that Jobcentre demos shouldn’t be done alone. We gave them all the help that we could and a sympathetic ear. The three regular people that have been dependent on our food parcels didn’t arrive this week. I hope that this is a sign of good news coming their way and actually some money in their pockets. But I will still be worrying about them. One thing that is very concerning though. There is an increasing amount of people approaching me that have had their three food parcels from the Trussell Trust and are no longer allowed any more. I’ve just had a phone call from a chap saying that he’s not allowed another one until October. How on earth is he going to survive? This is an awful ruling made by them, and they so far are refusing to change it. 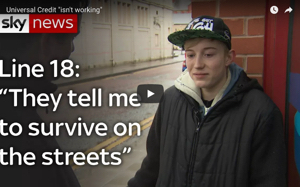 We will give him a food parcel every week, and the non Trussell Trust food banks will help him. It’s just awful isn’t it. I spoke to quite a few people today. One man was too angry to speak, obviously upset but he took a leaflet. Poor man no one should have to feel like that. I spoke to a man that has only just been released from prison. He’s got no where to live at the moment but is waiting for a place to be available at the local homeless hostel. He told me that the Jobcentre won’t leave him alone. He was quite agitated and I totally understand that. He needs time to become adjusted to life outside prison and to get his accommodation sorted out. I gave him some advice and a leaflet. I spoke to a lady who should have been claiming her pension, but due to government changes she can’t. So she now has to sign on and be actively looking for work. Poor woman. She should be retired and enjoying life. Yes, I’m very aware of the waspi campaign. I spoke to a young man who had had his esa stopped and he is appealing that. In the meantime the DWP have taken full advantage and have made him sign up to Universal Credit. He’s really feeling the strain and he didn’t know what to do. I gave him a leaflet, a listening ear and the details for the greater Manchester law centres free advice sessions. They will help him free of charge to get back what is rightfully his. Today was cold, the wind was blowing round the corner but we helped lots of people and all the food parcels werw given out. But I am so disgusted that we are still having to do this over 3 1/2 years later. It gets me so angry that people are suffering like this. I am aware of the politics of it all, check out my Morning Star reports out, but it doesn’t stop me from getting angry and frustrated. 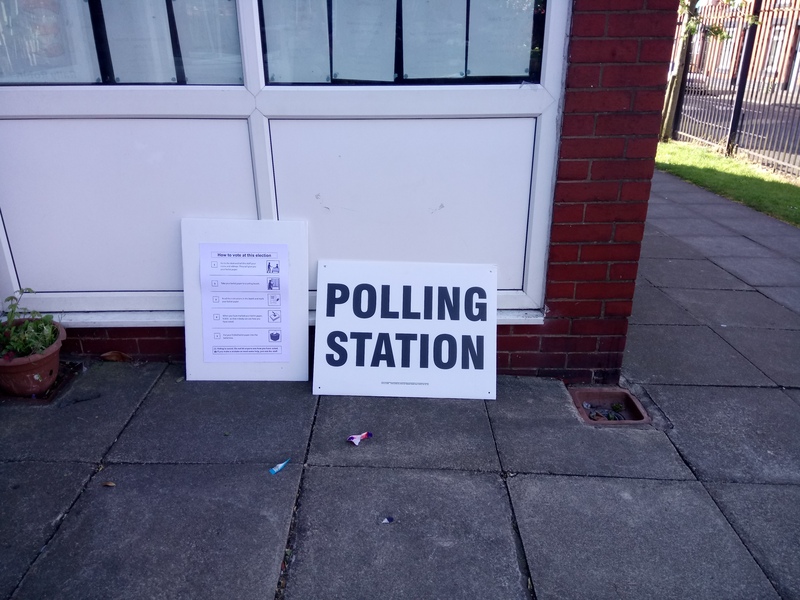 Today is local elections day up and down the country, and I urge you to all use your vote. We fought hard to get it and it’s so important that we use it. It’s the only way to effectively change things. And we urgently need to do this. Too many people are suffering and dying and it both breaks my heart and angers me. Many thanks to everyone that came along today. Without your support I would find it extremely difficult. I’ve had a busy week, rather stressful and it’s been a tad tough. But one thing is certain. We shall overcome! Today’s demo. 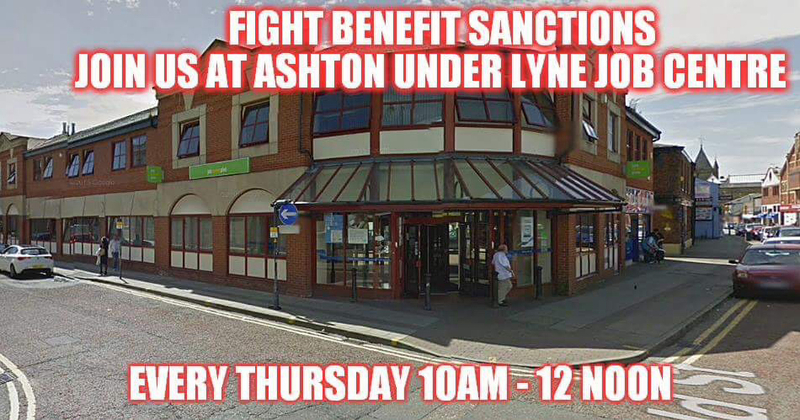 Refused a food parcel (not by us) and other happenings outside Ashton Under Lyne Jobcentre. Friday. A bottle of cordial and Gills tin of beans.